We are open! Come drop off during our standard hours, 9am to 1pm on Saturdays, or….drumroll…wait for iiiiit…DURING OUR BRAND NEW EVENING HOURS ON WEDNSDAYS FROM 6-8PM. Hello Composters! We are a week away from opening day, May 16! The pile will open with a flourish this year as part of the biannual stewardship day, “It’s My Park Day”. 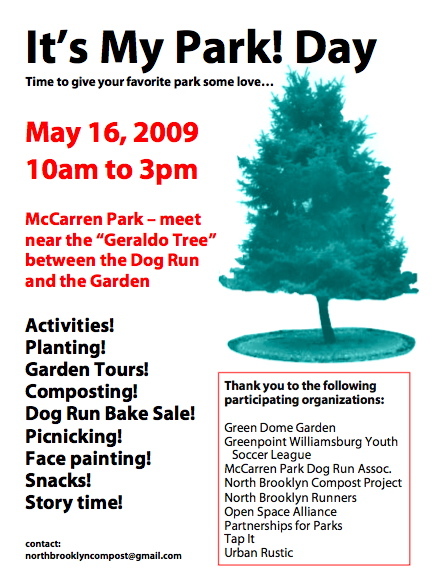 There will be a lot of fun activities in our neck of the park that day from 10am to 3pm. So come on down, bring your veggie scraps, and check out the scene. We will be using our freshly harvested compost to spruce up the trees around the triangle. BUT MOST IMPORTANTLY, sign up for your volunteer shift while you are at it! This project doesn’t work unless we all pitch in. Today the beta version of Ioby.org is up and running! You may have heard about this microfinancing project on WNYC recently, or know of other projects supported there…We have asked for funds to help fix our fence/gate and purchase a “fleet” of tricycles to move materials around the nabe. Click the link and pass it on!